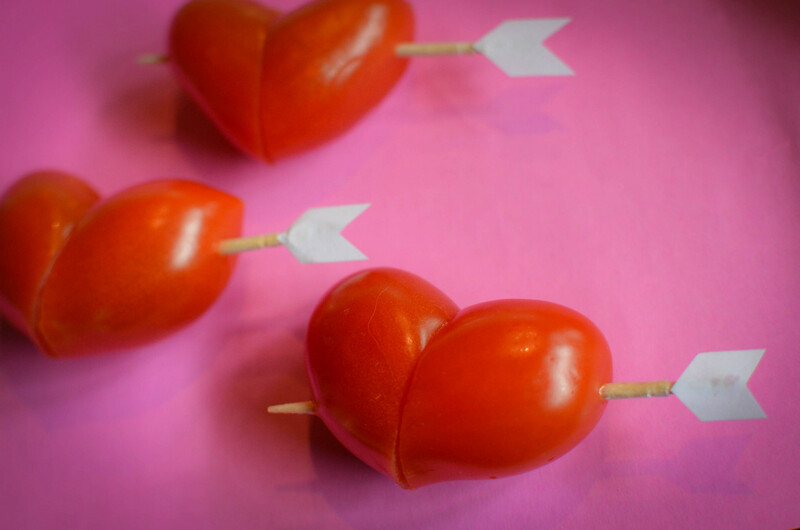 These are the cutest little Valentine’s Day appetizer! It's super cute and easy to make - we recommend you watch our video for instructions, since it's easy to show but hard to describe with words! Cut little arrows out of the white paper and glue them onto the blunt end of your toothpick. Let it dry. Imagine a line running from the top of the plum tomato (where the stem would be attached) to the bottom. Using a serrated knife or a very sharp knife, cut the plum tomatoes at a 45 degree angle from this line. The shape of the heart will depend on the size and shape of your tomato, and where you cut. We cut it about 2/3 of the way down. Do this with another tomato. Arrange the two larger pieces of tomato so that the cut sides are touching, so that it creates a heart shape. Pierce both pieces with the arrow toothpick. Copyright © 2012–2016 by Cook With Amber LLC.